Jack is holding Rose around her waist, cautiously lifting her up to the Titanic’s bow. He was a stranger up until days earlier, but still, her response is almost instantaneous. Moments later, Rose opens her eyes and she’s flying, arms outstretched as the mighty liner propels her forward. She and Jack hold hands; they kiss. Celine Dion’s music wafts in the background. Teenage boys in the theater start gagging, while romantic types swoon. When I say, “Everyone and their mom saw this movie,” I mean it a bit too literally because I actually saw it with my mom, as a 12-year-old, and it was… awkward. 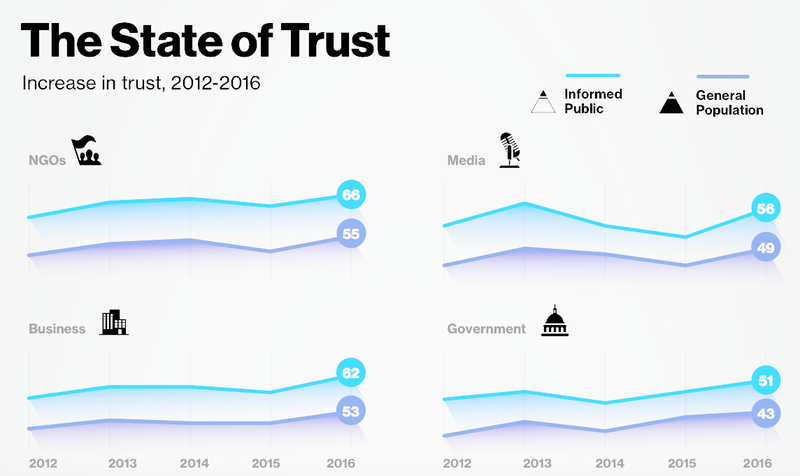 With that embarrassing story out of the way (I swear there’s a reason I mentioned it, and we’ll get back to it later), let’s move on to one you might actually care about: The state of trust in marketing. At the outset of 2016, trust toward all four institutions measured by Edelman Trust Barometer reached their highest levels since the Great Recession, with businesses seeing the largest spike. Things looked good. Confidence was high. We were all cruising merrily along. Then, we hit the iceberg that was 2016. You might remember that year not-so-fondly, for any number of reasons. This was a point where people were frantically piling into lifeboats. I think I just saw Billy Zane kick a little kid off one. What a jerk. Anyway, this is a problem. We’ve reached an era where people at large are digitally adept and savvy. They know they have a world of options at their literal fingertips, and can thusly hold brands to the highest of standards. Trust strikes a deep emotional chord. In other words: once the ship has sunk, it ain’t coming back up. “In today’s world, it is no longer a question of if a company will experience a trust incident, but when,” the report asserted. This is getting grim, I know. But we’re not underwater yet. There is time yet to turn this troubling tide, and as the primary conduits between customers and brands, marketers can and must be at the forefront. As we build relationships, we build trust. Edelman’s 2018 report found that company content is twice as trusted after a customer-brand relationship has been formed. Marketing has a lot of functions (even a great deal of functions?) but this one will be most vital in the months ahead. All of our efforts are doomed without this crucial piece of the puzzle. This seems to be the the sweet spot. Personalization is the surest way to build a rapport in the digital space. When we fail to connect, it sets off immediate alarms. Personalization comes in many forms. It can be as sophisticated as using adaptive AI, or as simple as narrowing the scope and voice of your content to resonate with very specific audiences. Whatever the approach, customers clearly want it. And the potential revenue benefits are undeniable. Now that sounds like smooth sailing. Research makes clear that marketers are wise to chart a course for more personalized waters. Granted, that’ll mean different things to different organizations and strategies, but it simply must be a central focus if we are to stay afloat. Personalized marketing is the byproduct of turning customer data into useful insights. It’s the industry’s prime directive as we speak. I’m excited to see what we can accomplish on this front in 2019 and beyond. I will leave you with one final word (statistic) of caution, however. A bit of good news: in the 2019 Edelman Trust Barometer results, released a couple of weeks ago, trust toward business increased in 21 of 26 markets, including the U.S. where 54% of respondents voiced confidence — one of the biggest jumps. Now, we need to stay that course. At a high level, personalization should be the true-north on every marketer’s strategic compass. But on a day-to-day tactical basis, I believe there are three focal areas for continually building trust. As it happens, I’ve attempted to incorporate each into this blog post you’re reading. Storytelling. My goal here was to take a set of statistics and craft them into a coherent narrative. For added effect, I juxtaposed it against another extremely recognizable story. Your mileage may vary on the wisdom and effectiveness of this particular approach. Transparency. Even — no, especially — when it’s information you’re not entirely jazzed to be sharing. I didn’t love telling you all about sitting uncomfortably next to my mom during the infamous “Draw me like one of your French girls” scene at age 12, but I did so with the hopes it’d signal an openness and candor in the writing to come. Recently I highlighted a company called Lemonade that runs a “Transparency Chronicles” series, in which they speak very frankly about their experiences as a growing business — including their failures and shortcomings. Customers are tired of hearing how great and perfect brands are. They want realness. 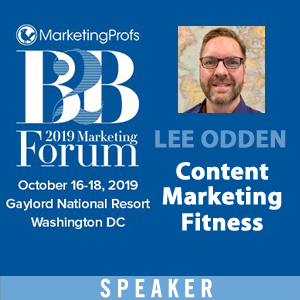 Content marketing strategies founded on personalization, with storytelling, authenticity, and transparency as cornerstones, will be primed to stand the test of time in an age of digital disorientation. 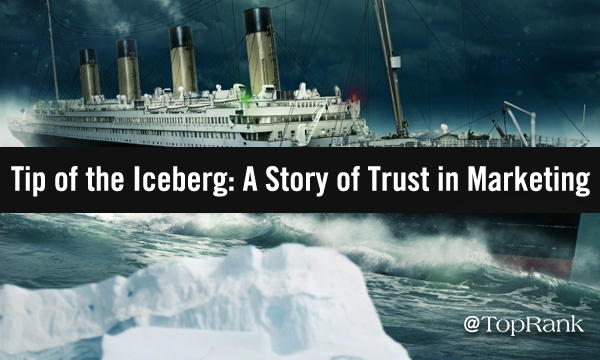 Maybe, one day, we can finally restore the fundamental trust that’s been shattered ever since some genius marketing mind came up with the “Unsinkable Ship” slogan.